since my last blog post, i was busy writing in czech (again) it is my new passion, and i had a few days pc free, well almost, i may have just read a tiny bit. me and mango are busy, and the days always pass in no time. the durians are so yummy, and we are sharing one magic durian almost daily, with pure joy, they are just incredibly creamy and full of amazing and fascinating flavours, always so original. durian enriched my fruitarian existence it is the most beautiful fruit gift for me. i love durian. but surely, durian is not the only fruit we enjoy, we are also enjoying drinking boxes of green grapes, about 1 box in 2-3 days. they are very very sweet and creamy in the juice form. they also have a very strong positive healing influence on me. lately i have had long periods of strong healing sensations in my legs, and this is always very exciting for me. i love raw fresh grape juice. and the nectarines are also very sweet, juicy and rich in flavour, and after 3 years of almost banana free days, i am eating super sweet bananas like a monkey again, having about 5-7 of them almost daily, mango has just 1 or 3 at times. and we also drink tasty pineapple orange, or pineapple orange banana juices. and how about those creamy rock melon smoothies? they are just perfect. tomatoes and lebanese cucumbers are also very sweet and tasty, so are the hot or not so hot chilies we are adding to our traditional pealed cucumber tomato mix. yum. yum. yum. mango is enjoying tasty avocados, i am still avocado free and i love it. my digestive system is working much better now, and amazingly i have at least twice as much poo. before i used to go once or twice a day, now it can be up to 5 times. even more. it is amazing how fast i forgot about this. i was big on avo only in my early fruitarian years, then i had one or 3 once in a blue moon, and since i met mango, who eats avo daily, i got in to that habit as well, and i learned to love avo more than ever... till my body fully rejected it; it refused to digest it and it threw it up. and, yes, because i poo more i feel better. the way i feel depends a lot on how my food is digested. clean intestines, clean mind. and lately due to avo rejection, i am eating less, i usually start with breakfast after midday often not until 3 or 4 pm. this has been my normal eating pattern for many years, for as long as i can remember. i was always a small eater throughout the day. i never eat or just a tiny bit while traveling, interacting with people, when i am upset about something, when i am feeling very high, or when excited. thank you tinah, for your sweet comments. 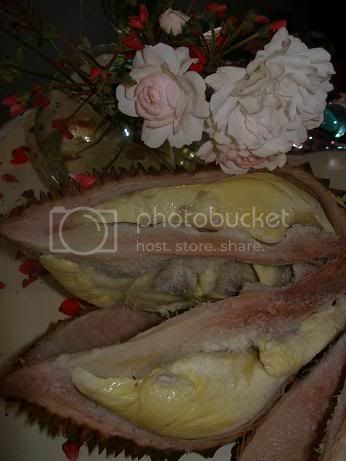 i also love durians with pink color in the husk, but to me they are all magical.